Actvity Summary: You will model the role of a shipboard sedimentologist and describe a split core. This is an inquiry-based activity and it will draw on and further develop your scientific skills of observation and description. You will also learn how important it is in science to be complete and consistent in recording your visual observations. The shipboard sedimentologists are responsible for describing the lithology and stratigraphy of sediments and sedimentary rocks that are recovered by scientific ocean drilling. Lithology is the set of physical characteristics of the rock or sediment. Stratigraphy is a term that refers to the classification, nomenclature (naming), and interpretation of layered rocks and sediment. 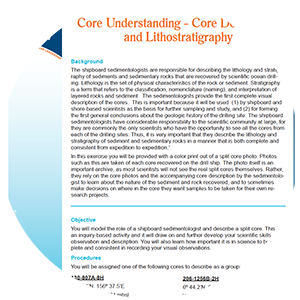 The sedimentologists provide the first complete visual description of the cores. This is important because it will be used: (1) by shipboard and shore-based scientists as the basis for further sampling and study, and (2) for forming the first general conclusions about the geologic history of the drilling site. The shipboard sedimentologists have considerable responsibility to the scientific community at large, for they are commonly the only scientists who have the opportunity to see all the cores from each of the drilling sites. Thus, it is very important that they describe the lithology and stratigraphy of sediment and sedimentary rocks in a manner that is both complete and consistent from expedition to expedition.1. In this exercise you will be provided with a color print out of a split core photo. Photos such as this are taken of each core recovered on the drill ship. The photo itself is an important archive, as most scientists will not see the real split cores themselves. Rather, they rely on the core photos and the accompanying core description by the sedimentologist to learn about the nature of the sediment and rock recovered, and to sometimes make decisions on where in the core they want samples to be taken for their own research projects.